Blue Dart is a South Asia based courier company known for express air and integrated transportation. They deliver to over 35000 locations across India. Their service is top notch not just for forward orders but reverse orders as well. Alongside Shiprocket, they can add significant value to your eCommerce business. With Blue Dart’s powerful shipping service and Shiprocket’s all-in-one dashboard, you can process your orders at a much faster pace and in a cheaper price. Upon choosing Shiprocket, you can get access to not only Blue Dart, but 14 other carrier platforms which are as competent as Blue Dart. 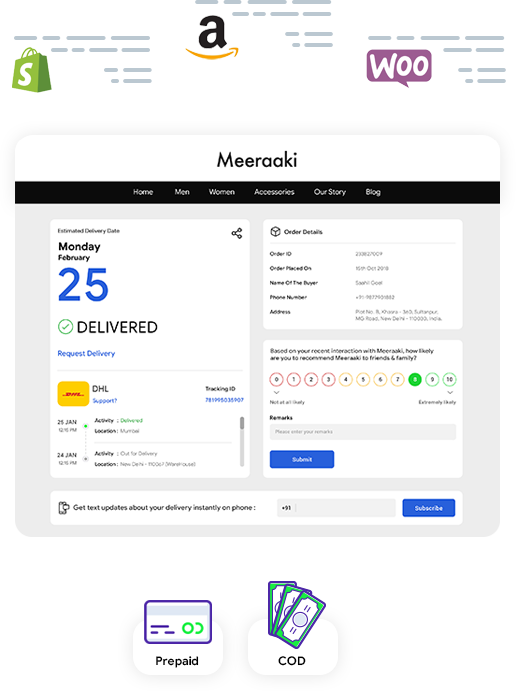 Our Courier Recommendation engine tells the most suitable courier partner for each shipment based on their pickup & delivery performance, COD remittance, and RTO orders. Easily manage orders on a single dashboard with inventory management and catalog sync from different websites and marketplaces like Shopify, Woocommerce, Amazon, etc. Give your buyers the luxury of choosing their preferred payment option from COD and prepaid payments. Provide your buyer with a customized order tracking page that contains your company’s logo, links to other relevant pages, banners for promotion, an NPS score, and your support details! We do not charge any set up or recurring fee! You only need to pay for the courier charges of each shipment.